‘Yacon’ or ‘Peruvian Ground Apple’ comes to us from the Andes, offering sweet jicama-apple flavor/texture in a potato like storage root attached to subsurface rhizomes. Drought or frost kills surface foliage ….. surface foliage which resembles Yacon’s close relative the Sunflower. Plant spring or early summer and harvest when cold knocks down the surface foliage or Autumn has progressed well into Fall, this exotic edible takes a LONG season to produce a harvest. Give regular water and and place in full sun, treat it as you would a Jerusalem Artichoke. Devote two feet volume of soil per plant and expect surface foliage to reach four feet. Unlike potatoes, the edible part will rot if left over-long in the soil and it cannot be grown by transplanting tubers, instead try cuttings. 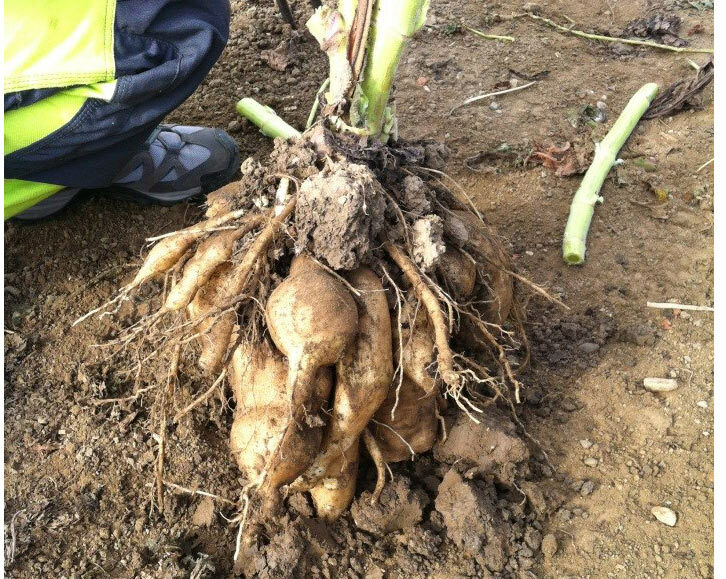 Yacon contains an indigestible form of fructose called ‘fructooligosaccharide’. Diabetics tolerate this root crop well and Yacon and Yacon-derived syrup have become something of a niche food for diabetics across the planet. A tea made from young Yacon leaves is also popular with people who experience blood sugar problems. A quick GOOGLE search will return quite a few interesting salad recipes using Yacon.